Are you struggling to find space at home and want to get rid of all the clutter in the house? Are you constantly fighting with old items that need taking away, but you never have the time? Do you simply want help with the disposal of the junk at home? Well then look no further than Go Rubbish Go. We will handle your Chalk Farm house clearance whenever you want us to. We are the leading NW1 house clearance company and we will do the job whenever and wherever you need us to. We can help anyone in Chalk Farm and all you have to do is dial 020 8610 9182 today and ask for your free quote. Money is not a problem when it comes to our Chalk Farm house clearance services. We have all the best deals for you as we always make sure to be ahead of the competition when it comes to NW1 house clearance prices. All our prices are backed up by high quality services and while the prices drop, the same will never be true about the quality. No matter the price, the service you get from us will always be quick and efficient. We are the dominant force in town and we will prove it with every job you have for us. Behind every quality service there is a great team dealing with the job with excellence. Our teams always do a wonderful job in Chalk Farm because they consist of well-trained professionals who are bent on doing a great job at all times. Make no mistake, when we are on the job, you have only the best working for you. Open the door wide and let a wonderful team step in and take care of the NW1 house clearance is so popular for. Come to us and we will provide you with just about everything you need for a thorough and meticulous house clearance in Chalk Farm. But what do you actually gain from our NW1 house clearance services? The advantages of using a house clearance in Chalk Farm are the same as anywhere else, really – when you call 020 8610 9182 and you get a team over, you are in for a quick service; one that will make sure that no clutter is left behind and that you are left with only the items you are using. Fewer items to deal with means more space for you, better air circulation, and overall much better room atmosphere. We will help you with all that and all you have to do is give our customer service department a call. We make sure that your recycling is properly done by doing it ourselves. 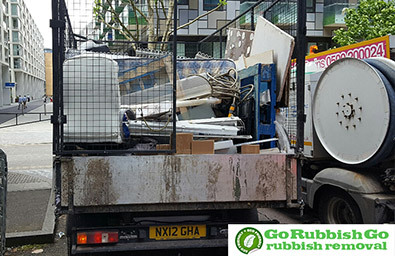 We make sure that at least 85% of your waste and clutter gathered during house clearance NW1 are taken to the local recycling centre and put through the works so that they are reused instead of dumped in a landfill. The latter is a word we never use and will not start using because we never use it unless it is the last option available. We make sure that the environment is taken care of and we do nothing to pollute it. Our house clearance in Chalk Farm is immaculate and green – something we take great pride in. 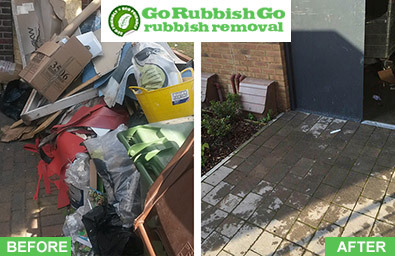 Here at Go Rubbish Go we understand what the customer needs and when the customer wants a good house clearance in Chalk Farm, we deliver. We provide everything that one might require: a speedy service, a properly working crew, efficient clear-out at a low cost, and a happy customer to end with. 100% customer satisfaction is the reward the customer gets for choosing us and the reward we get for doing our job. If you want to book our high quality cheap house clearance NW1 services, all you need to do is get in touch with us on 020 8610 9182 and request your free estimate. We will do all the work that needs to be done, and you can take that to the bank. 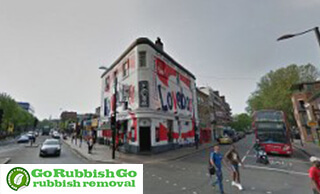 Chalk Farm is located in the northwest part of London, within the London Borough of Camden. It is a small district of predominantly urban character and often considered the northern part of Camden Town, being so close to the area. It has quite good links to neighbouring areas, with Chalk Farm underground station and being served by many bus routes, some of them going as far as 70 years back. The Roundhouse is a popular attraction here, once a circular turntable for railway engines and now used as a performance venue. The area has been home to a lot of celebrities and actors, such as Jude Law and Sienna Miller.